Different regional cultures have different preferences for colors. For example, Japan likes quiet and grey tones, while Italy prefers brilliant colors. China has also formed its own unique color culture: blue, reflecting the ancient and dignified beauty of bronzes; red, representing the joy of the nation, and yellow, the symbol of Chinaâ€™s feudal society, exuding the strong traditional culture of China. In modern packaging design, rational use of traditional colors and proper expression of the cultural connotation of color can make the work disseminate the artistic charm of the nation. 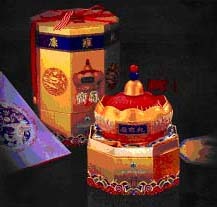 Similarly, the "Mingbao Shangzheng" Mid-Autumn moon cake gift box adopts rich Chinese traditional colors, with red, yellow and dark gold as the basic colors, and with traditional patterns, with Chinese characteristics.